The Madison Police Department proudly announces the newest member of its K9 Unit, Patton. K9 Patton is an almost two-year-old German Shepherd who was born in the Poland. Patton is handled by Officer Nick Eull and replaces Officer Eull’s former partner, K9 Frees, who retired recently. Patton is sponsored by the generous financial support of Mid-West Family Broadcasting. As sponsors, Mid-West Family Broadcasting has the naming rights for this dog. Patton is named after WJJO’s former Assistant Program Director, Music Director and mid-day radio host Blake Patton who retired from the rock station in 2010. Patton is a dual-purpose canine trained to detect illegal drugs, track people, search buildings, and locate evidence in addition to other trained skills. Officer Eull and K9 Patton recently completed their certification process and are assigned to the day shift. Please join us in welcoming Patton to the team! 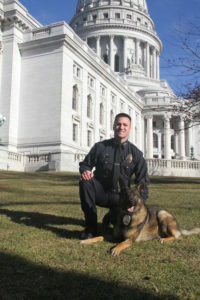 For more information on our K9 unit, follow us at www.cityofmadison.com/police/field/k9/ and follow our not-for-profit fundraising organization, Capital K9s at www.capitalk9s.org/. Our unit is grateful for the financial support of Capital K9s and our sponsors, which enable us to continue to provide our community the services of a highly trained and professional K9 unit.